Shot of the Bank One building here in town. This is the b & w version and unfortunately due to the size restrictions, the detail of this shot suffers greatly. After the voting process I will post the color version if it draws interest. Cropped to ensure a level alignment. I've just seen the colour version and have to say, why on earth did you make it B&W?!! LOL. i just knew this would win. Congrats!! I think the color version would have done just as well. Not much to say about this fantastic shot ....WOW about sums it up!! Just a great shot and I'm so proud I thought so during the challenge. The perspective, the reflection and the tones..wonderful. truly an awesome image! well deserved! Congratulations on your blue ribbon. I had a feeling this was you, xertion. Your other ribbon shot had quite the similar style. Congrats on the win. Wow, I think I like the color version even better.... Congrats X! Thank you very much to everyone who left comments and voted! Congrats on the win... you deserved it, a great picture. One of two favourites in this challenge. Well done to find this object. Perfect in b&w and the focus is good too. Composition can´t be better. Good luck! Great perspective, great leading lines. Very nice. Nice tones, composition, reflection, everything. Well done. Nice subject and I like the reflections. Good lord this is just wonderful! The clouds, the reflections, the illusions. I can't think of anything I'd change about it. Great Job! phenominal shot! great depiction of symmetry.. great exposure/tones... leading lines.. patterns. shapes.. it has it all! Apt title. This has my interest! Tones and light are marvelous. Very nice! Couldn't get much better. Beautiful image. Perfect symmetry entry. 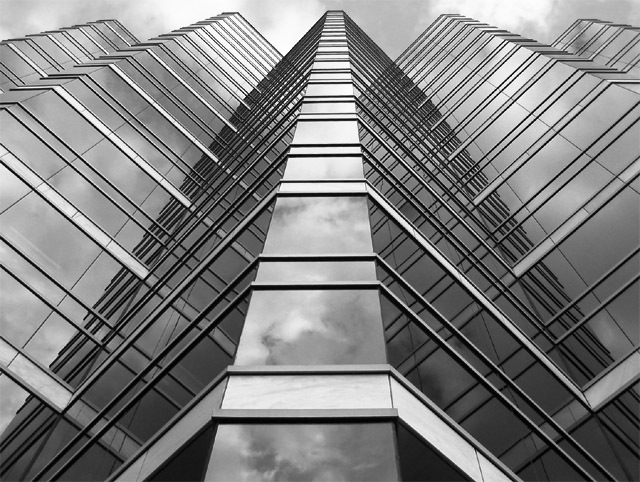 You've done an excellent job of capturing the detail and moodiness of the grey, cloudy sky against the glass building. Nice symmetry. I like the reflections. NOOOOOOOOO!!! You made such a great picture but it's TILTED to the right!!! Actually it's not tilted now that I look at it more, you needed to move over to the left about 5 to 10 feet before shoting. This is really great. If it were perfectly aligned I'd give a perfect 10. Like this... a 9. Greyscale works well with this image. Nice composition and content. My only criticism, and this is minor, is that you are ever so slightly off on "true" symmetry. There is more on the left side than the right. This is an excellant image, good photograph of its own accord and meets the challenge nicely. Lovely reflections. Would look wicked if it was in colour with a bright blue sky. Is this a building in downtown Toronto? Very powerful - perhaps a _little_ asymmetric. 7. Proudly hosted by Sargasso Networks. Current Server Time: 04/20/2019 02:59:44 PM EDT.